I was on my way to my mother’s house to pick up some of her world famous empanadas for my neighborhood holiday party yesterday (it was great to meet everyone, if any of you are reading), when I got a frantic text from my buddy Tom telling me about a trade the Yankees had just made with the Miami Marlins. When I first looked at the deal, I was dumbfounded. What the hell were the Yankees doing trading Martin Prado, one of my favorite Yankees of the last few years? I immediately hated the move. Then, I got to see what the full trade was, and now I’m OK. Do I wish I had the chance to watch Prado over a full season on my team, of course. Would I rather have a 25 year old pitcher with a monster arm in the rotation? Duh. Let’s take a look at this deal, and evaluate it. Here’s the full breakdown: The Yankees have sent IF/OF/Baseball Player Martin Prado and right handed Starter/Reliever/Pitcher David Phelps to the Marlins in exchange for right handed starter Nathan Eovaldi, 1B/OF Garrett Jones and right handed pitching prospect Domingo German. OK so, as I briefly mentioned in the opening paragraph, I really really really like Martin Prado. I love his versatility, and I think he has a great bat and plays good defense at whatever position you stick him at. He was scheduled to play Second Base for the Yankees in 2015, but he could have filled in adequately at Third Base, First Base and the corner Outfield spots if/when anyone had gotten hurt. He was always one of those guys I wished the Yankees would trade for, so when it finally happened last season, I was over the moon. I was at the game that he won with a walk-off single against the White Sox, and I cheered my head off. I am slightly heartbroken that Prado is gone. That being said, The price might be right here. Prado was set to make $11 M in each of the next two seasons. Dealing him will provide the team with some financial flexibility, if they want to add a player for five or ten million dollars a year. We’ll always have the summer of 2014, Martin. The main return here is definitely Nathan Eovaldi (pictured above). Here’s what we can say about the soon-to-be 25 year old righty. Gas. Dude throws gas. According to fangraphs, Eovaldi had the fourth fastest average fastball velocity in the entire league last year, with 95.7 mph on average on his heater. Like anyone with a good number one, he threw that 62.9% of the time, backing it up with an 86.3 average mph slider 24.7% of the time. He also throws a Curve Ball about 10% of the time and a Changeup that he rarely throws, but he’s going to be made or broken by his fastball. 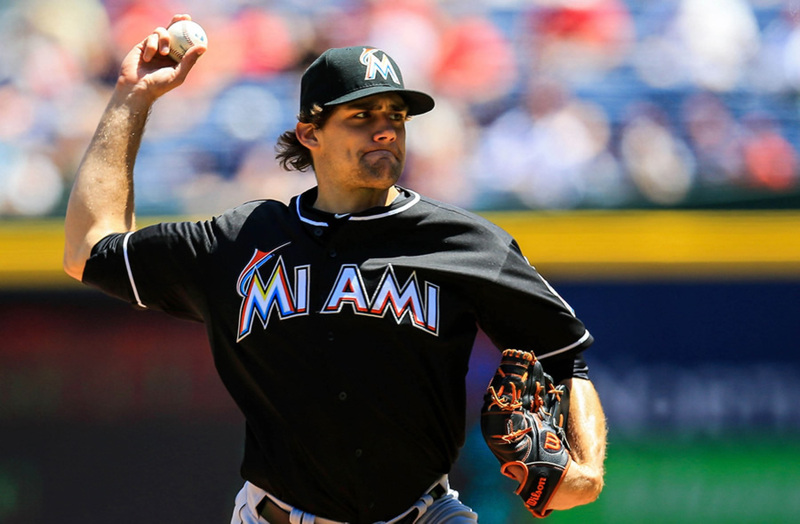 a As far as the contract goes, Eovaldi will be entering his first year of arbitration eligibility, and is predicted to earn about $3.1 M or so for the 2015 season. He’s under team control until 2018, which is nice too. The Yankees must really see something in Nathan, who has a 4.07 ERA in 460 career major league innings with 6.4 Ks/9 and just 2.7 BBs/9. He’s a guy with a power arm that they can fine tune over the next few years. He did lead the league in hits allowed last season, and is a bit of a fly ball pitcher, but again, he’s only 25, and still on his way up in the baseball world. The other guys in this trade are nice pieces, but won’t make or break anything. Phelps is a 28 year old right-hander who has been a long man and a spot starter for the Yankees since he made his Major League debut in 2012. He’s a good pitcher to have because he’s versatile and won’t kill you most nights when he’s on the mound (4.21 ERA in 299 career innings), but he’s not a game changing type guy. His ceiling, if it’s not his current role, is as a fifth starter, which is probably what he’ll do on the Marlins. Considering the Yankees drafted him in the 14th round (out of Notre Dame), he has provided a return well beyond the expectations I’m sure anyone in the organization had for him, and now he’s helped bring in a younger, much more talented pitcher. Jones, meanwhile, is a 34 year old lefty First Baseman and Outfielder with some power (has averaged about 19 homers per season as a Major Leaguer) who will provide perfect insurance for when Mark Teixeira gets hurt, when Carlos Beltran gets hurt or for when Alex Rodriguez stinks up the joint. Jones is probably going to challenge Alex for DH time against righties as it is, and can be used to spell players at a few positions. I like his bat, and at $5 M, aka Chris Capuano money, I like the price too. He will help this team immenseley if they are able to use him as a platoon type player. If people get hurt and he has to have 600 ABs, that’s probably going to be a problem, but in the role he’s meant for, he’ll be very good for this team. The throw in prospect, Domingo German, is a guy that could end up being a solid back of the bullpen guy, but he’s 21 and was just in A-ball last year, so it’s hard to tell how he’ll pan out. Overall, he’s a good arm that will contribute to the system. I like it. Jones should fit in nicely as soon as Teixeira’s tissue paper tendons and muscles begin to tear. There are positives and negatives to this deal. By trading Prado, the Yankees are banking on one of their two young Second Basemen, Rob Refsnyder and Jose Pirela, to establish themselves as legitimate Major Leaguers. With last week’s Chase Headley signing, it seemed like the infield was going to be extremely solid defensively. Now, one position is definitely a little up in the air. That being said, we’ve all complained for three seasons now that the Yankees didn’t bother to get bench insurance for their aging and decrepit offense. With Jones, they’ve done just that. With Eovaldi, they’ve traded for a guy with a really live arm, with a lot of upside, who is very young and still has a lot team control left. I’ll take Eovaldi over Phelps 10 out of 10 times. I think that, in the long run, this trade is going to improve this team. Refsnyder and Pirela won’t be as good as Prado at Second Base or in the lineup in 2014, but the experience they’ll get in 2014 will help them get better, if they are indeed meant to be every day guys for this team. Eovaldi vastly improves their rotation (assuming they’re serious about not adding anyone else via free agency), because he’s a known commodity that will give them 200 innings. The rest of the rotation is kind of up in the air as far as reliability goes. I didn’t like this trade at first because I love Prado, but the more I think about it, the better it looks. Welcome Garrett and Nathan. Nice knowing you, David and Martin.